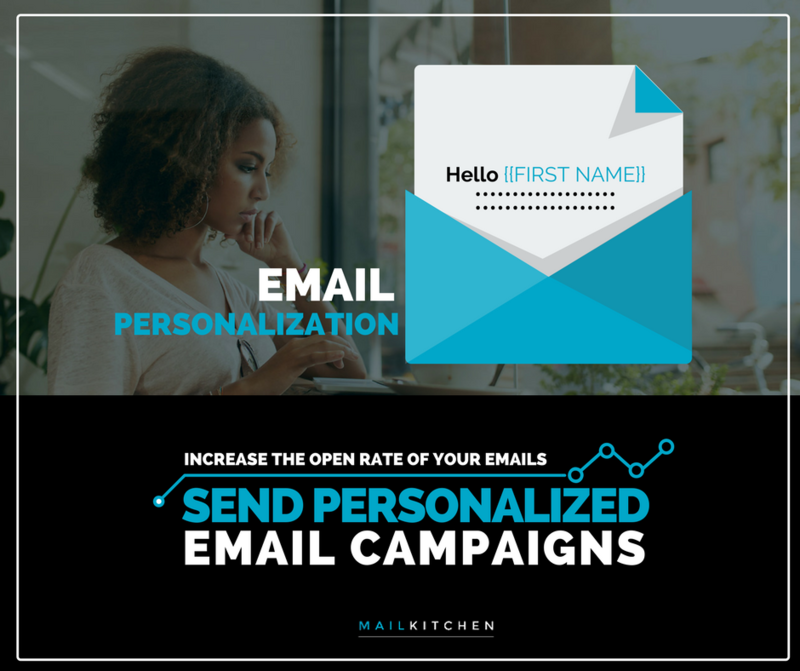 Email personalization is an email marketing technique that consists in inserting tags (also called custom fields or merged tags) in the content of the message you send to your subscribers. The tag allows you to automatically insert a custom text (the name of your subscriber for example) for each recipient of your email campaign. 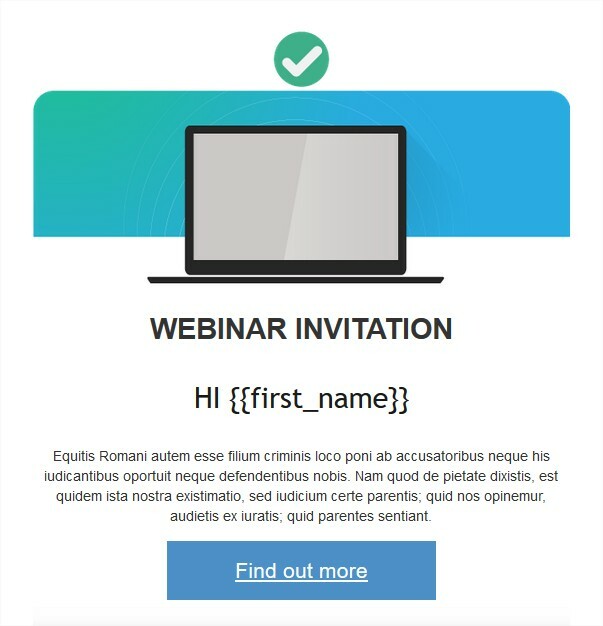 According to numerous studies on the subject, personalized emails have a deliverability and open rate above average – and according to some studies, the rate of opened emails can increase up to 29% by inserting the name of the recipient in the subject of the email (read the marketing study by Marketing Sherpa). Beyond the possibility of simply inserting the name of your recipient in the subject line or the content of your message, custom fields can have various practical applications in email marketing. For example you can customize a URL link in the content of your message and therefore send a generic promotional offer to your entire database, but personalize the URL link of the landing page to which you want to redirect the recipients (to a specific category of your website, based on the purchasing history or the visits of each user). To import the email addresses and the related information you must import a file using the CSV format (semicolon separator), the different information must be separated by columns in the original file (email, fisrt name, last name, etc.). You can insert the tag of a custom field either in the subject line of your email campaign, or in the content of your message. You only need to place the cursor where you want to insert the text of your field and to click on the button +Option: add a personalised field in the subject. To insert custom merged tag into the content of your email, you must first create a text box. 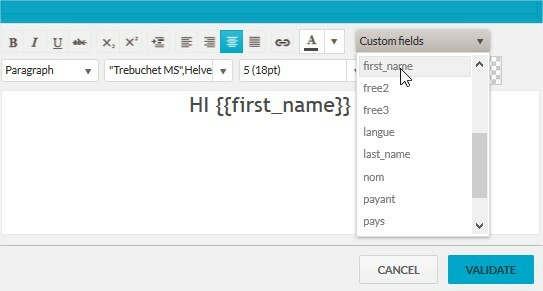 In the text editor you can click on the button Insert a custom field . In some cases, you won’t be able to check your email by sending a simple TEST EMAIL. In fact, when you send a TEST EMAIL the software will randomly choose one of the email addresses from your email database (from one of yours mailing lists). If the email address randomly chosen by the software does not contain the custom fields you wish to test (if you only imported the email address without other related information), the tag inserted in the content of your email will display an empty field. To test your personalized email, you must create a test mailing list, import 2-3 test email IDs (you need to import a file containing the email addresses and the fields you want to test) and send a real email campaign. If, on the contrary, all your contacts in your email database have associated custom fields, you can test your personalized email by sending a simple TEST EMAIL. Once received, the tags in the email will be replaced with the text (name, first name or other) associated to the email address of the recipient (the one displayed at the bottom of your Email “This email was sent to…”) . Unsubscribe link: How to insert a unsubscribe link in your Email Campaigns?